Drug abuse is a quick way to wreck your life. Take the high road, live a healthy, productive life, without the need for drugs. Look around you. Most teenagers are not using drugs. They understand that drug abuse could rob themselves of an education, a family, a job, and even their life. So, don't give-in to peer pressure. Real friends don't try to get their friends to abuse alcohol or do drugs. Drugs can affect your entire body and your well being. Despite the glamorization in movies or music, drugs can produce tragic consequences and affect the body's natural chemistry. Many drugs are highly addictive. Your dependence increases, while your self-control decreases. Some drugs, like crack cocaine, become addictive the first time you try them. The older a person is before beginning to drink alcohol, the less likely they will develop a drinking problem later. "Some drugs are fun and cool"
"I can't get in trouble...drugs won't hurt me ." "I know my limits. 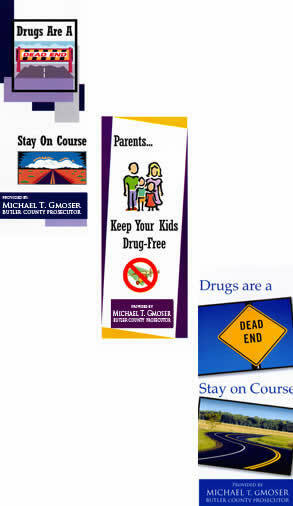 I can stop using drugs whenever I want"
"Drinking alcohol as a teenager isn't that big of a deal"
Our office offers several pamphlets to help inform teens on the danger of drugs. Please feel free to download our pamphlets or contact our office to see if we have copies in bulk available. Prescription and over-the-counter drugs can be just as dangerous and addictive as street drugs, but are often times more easily accessible and harder to recognize when there's a problem. Visit DrugAbuse.gov for information regarding Rx and OTC drug abuse and ways to prevent your loved ones from becoming addicted.